In our previous post, we introduced you to the fascinating world of diamond cuts, including the round brilliant, the princess and the emerald cut. 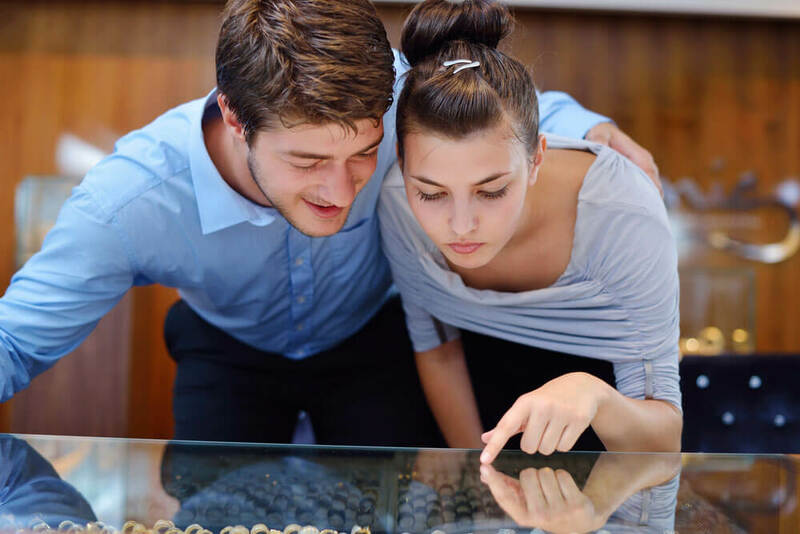 Now, we’re looking at some other intriguing cuts to help you find the perfect engagement ring. 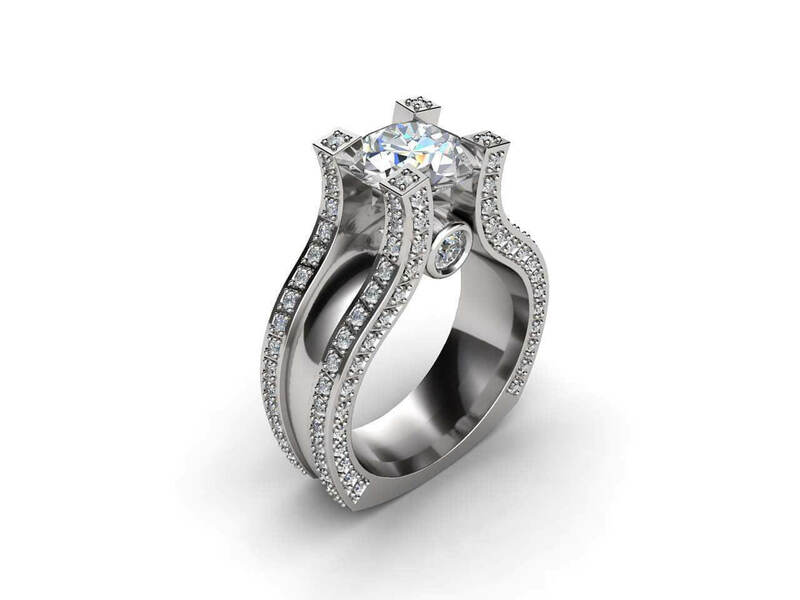 Our glamorous Timothea engagement ring with a radiant cut diamond. This distinctive cut is truly deserving of its name. It has a dazzling 70 facets, and combines the best of the round, emerald and princess cuts to create a mesmerising effect. First created in 1977 by Henry Grossbard, the radiant cut surpassed the brilliance of the previous square and step-cuts of the past. You’ll find the radiant cut in our stunning Timothea engagement ring, featuring a square centre stone surrounded by 16 round diamonds on the band. 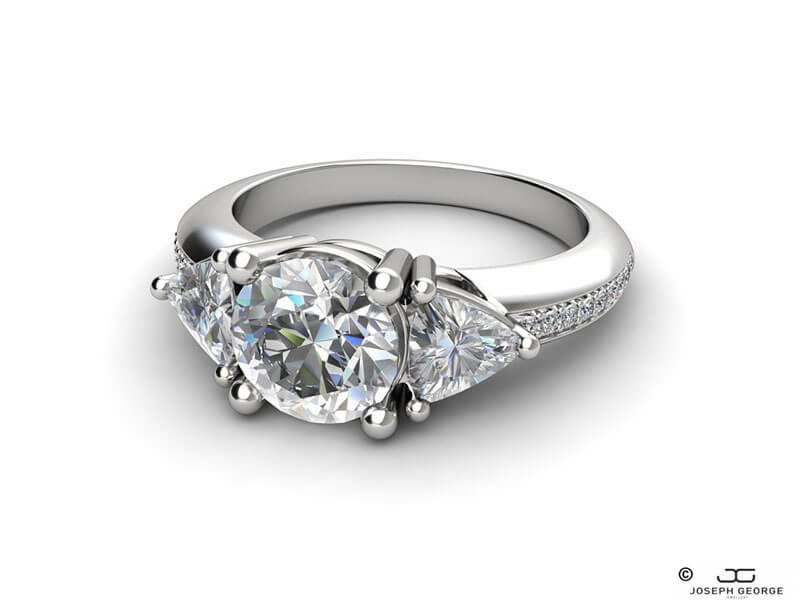 Our Eugenia engagement ring features a stunning marquise diamond. This elongated cut has its history in France, first appearing in 1970s Paris. Also known as a navette (French for ‘little boat’), the marquise cut generally has 58 facets, maximising the size of the carat. Seen more rarely in engagement rings, the marquise cut is a true vintage style, once worn by nobility to demonstrate their status. Our Eugenia engagement ring features a stunning solitaire marquise diamond in a contemporary setting. The Niobe engagement ring with its charming heart cut diamond. The endearing heart cut is a perennial favourite, featuring a glimmering 56-58 facets. 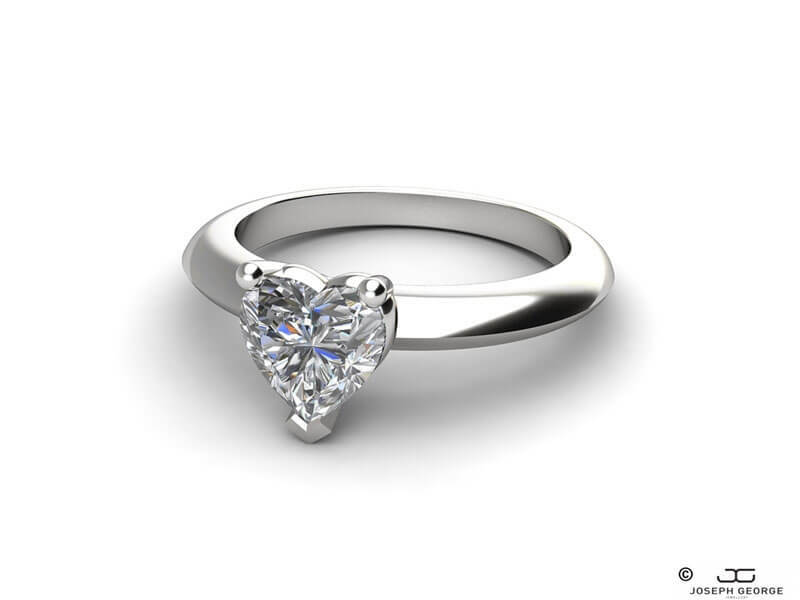 A symmetrical shape that is a variation on the brilliant cut, it’s uncertain exactly when the heart diamond first emerged. However, the symbol is often associated with royalty. Mary Queen of Scots gifted a ring with a heart-shaped diamond to Queen Elizabeth as a sign of goodwill, and French nobleman Cardinal de Richelieu treasured a 20 carat diamond heart. The Niobe engagement ring features a beautiful heart cut diamond between 0.50-2.00 carats, set on an elegant knife-edge band of platinum, white, yellow, or rose gold. Trillion cut diamonds are the perfect match for the central round cut diamond on the Kalypso ring. The triangular trillion cut, also known as the trielle, trillian or trilliant can come in many forms. They can have either straight or curved sides, and may have anywhere from 31-50 facets. 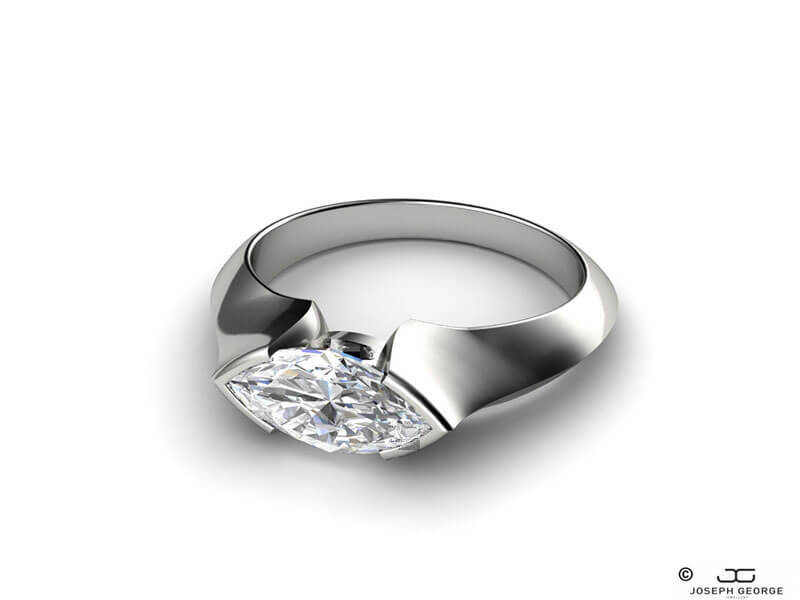 The unique shape highlights the inner fire of a diamond, and are often used to complement a solitaire stone such as the trillions in the glittering Kalypso engagement ring. 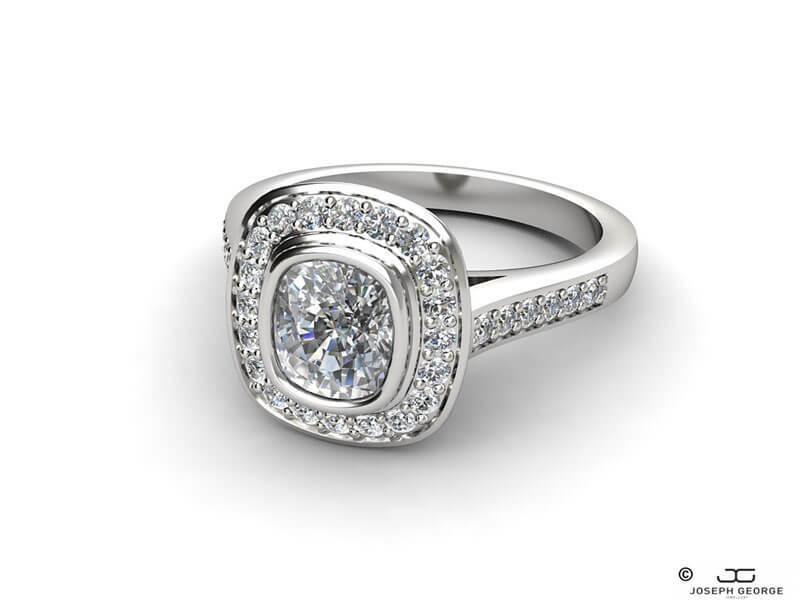 The Kalliope engagement ring with a glittering cushion diamond. 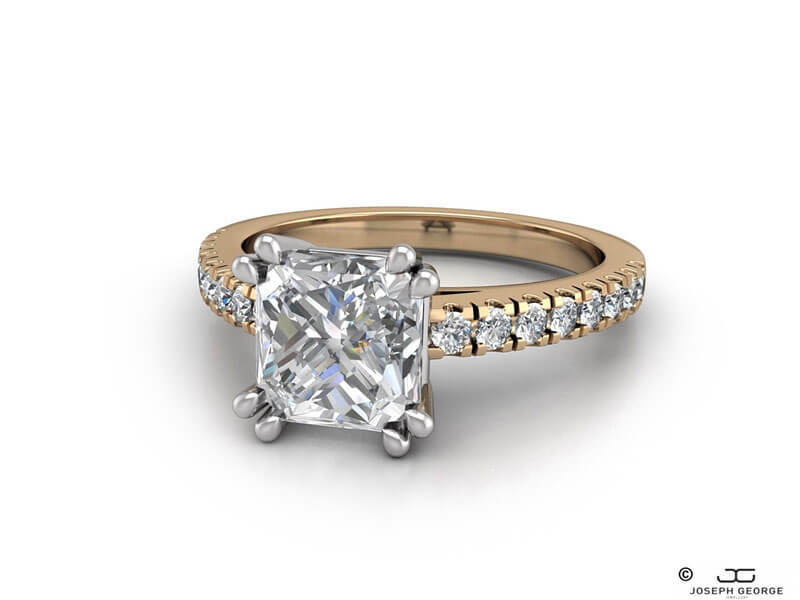 The cushion cut is a modified brilliant cut with rounded edges, also called a pillow or candlelight cut. First appearing in the 19th century, the cushion cut had its origins in the old mine cut – a square cut with rounded corners. Many cushion cut diamonds can be described as having a ‘crushed ice’ effect, due to their sparkling inner appearance. A scintillating cushion diamond is at the heart of our Kalliope engagement ring, surrounded by a halo of smaller round diamonds. For more inspiration to help you decide on the perfect engagement ring, have a look at our collection at Joseph George today.